Description: Reissued on CD for the first time! Japan-only CD reissue of Crown Records jazz albums! 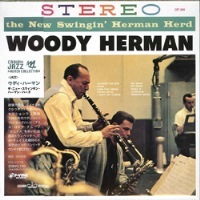 When this album was recorded in 1960, the legendary bandleader and clarinet/sax player Woody Herman was in-between his "Second Herd" and "Thundering Herd", and didn't have fixed members. Without musicians' credits it is difficult to ascertain but Hidetoshi Tanaka, who wrote the Japanese liner notes in this world premier CD reissue, says he has reasons to believe the band included Bill Chase, who would later lead a brass rock group Chase, plus Don Rader and Paul Fontaine on trumpet, and Jake Hanna on drums. The band is powerful and swinging, with the exceptionally strong and tight brass section. A collector's item and must-have for fans of Woody Herman!